What feeds your soul? This is the question on the table today. Pull up a chair and bring your soul food. Are you weary and heavy laden? Jesus is calling you to rest. That looks different to all of us. He made us, and knows what feeds our souls. Ever since I was a child music has been my soul food, and singing, it’s like a decadent dessert in a five star restaurant. I would sing along with the radio from the time I could talk. More than often I could be found in the doorway on the tile stage with a brush for a microphone. Today I have my own real mics, a stand, and a rock blocker I can take anywhere. When I sing I feel like I’m doing what I was born to do. Like a horse running with wind blowing through its hair. When I watch American Idol and The Voice I secretly want to be a contestant. Singing in the shower, in the car, karaoke, at a wedding, or on stage it is all a pleasure to me. Without music in my life my soul wouldn’t rest. Lyrics feed my soul, and help me detox what ails it. Shhhhh, don’t tell anyone, but I write songs, and spontaneously sing new ones to God when no one is around. Sing unto the Lord a new song is scripture that is thrilling to me. So what do you have in your soul food box? Would you care to share? Leave a comment below. Wanna find rest? More than for the body, but for the soul? Checkout the book club my friend Bonnie Gray is starting today. Join her Facebook group, or just read what others have said about what feeds their soul. Yes! Music!!! Gosh, music can soothe my soul in the most stressful of times… especially songs praising Him name. 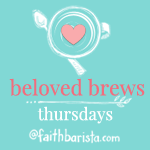 Love your frank and open style of writing, Melinda, popped over from the #BelovedBrews linkup 🙂 Stay groovy! Love this Melinda! I love how you sing to the Lord a new song! Keep singing and keep writing! Blessing to you! You go girl! Singing worship songs sends the devil running. Love you. Your post has me smiling and giggling. We love to sing here too. It’s even more fun with our grandson. Thank you for this joy today.